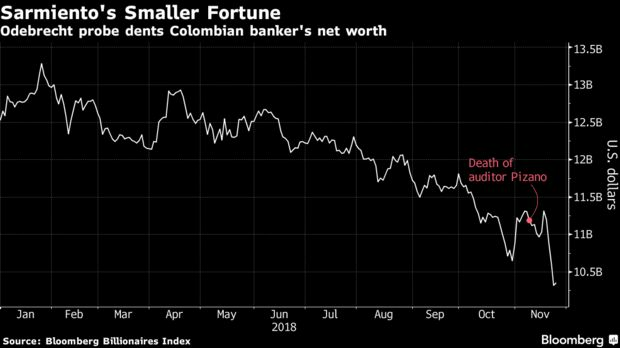 The death of a key witness in a Colombian corruption probe and the cyanide poisoning of his son three days later have left a $1 billion dent in one of the world’s great banking fortunes. Luis Carlos Sarmiento, the founder of Colombia’s biggest banking group, has seen the value of his empire shrink as investigations into Brazilian construction giant Odebrecht SA cast a shadow over its former partners, including Sarmiento’s Grupo Aval Acciones y Valores SA. Shares in Grupo Aval have fallen 27 percent in dollar terms this year, the worst performance among the 20 biggest banks in Latin America. Shares in Bancolombia, Aval’s main competitor, rose 2 percent over the same period. Jorge Enrique Pizano, an auditor for one of Sarmiento’s companies, warned about suspicious payments by Odebrecht as early as 2013. He died this month from what authorities said was a heart attack. His son, who returned from Spain for the funeral, then died from poisoning in circumstances that remain mysterious. In the preceding weeks, Pizano had expressed concern for his safety, sought shelter in the U.S. and handed over evidence of irregular payments to journalists and the U.S. Federal Bureau of Investigation. After he and his son died, the selloff of Aval shares intensified. Sarmiento’s fortune has fallen by about $1 billion, to $10.2 billion, since Pizano died on November 8, and is down more than $2 billion this year on the Bloomberg Billionaires Index. One of the contracts Pizano flagged as suspicious was a $2.7 million payment routed via New York to a bank in Panama. Semana, Colombia’s biggest news magazine, reported that in September Pizano had a four-hour meeting with FBI agents at the U.S. embassy in Bogota, at which he handed over audios and documents relating to Ruta del Sol. The FBI declined by email to confirm or deny the existence of an investigation. Aval’s net income jumped 79 percent in the third quarter from a year earlier. This strong performance has been overshadowed by the risks created by the investigations, said Carlos Rodriguez, head of equities at Ultraserfinco brokerage in Bogota. “When international authorities get involved, and above all U.S. authorities, there’s a risk of something additional coming out, something we don’t know about,” Rodriguez said by phone. Aval’s subsidiary Corficolombiana partnered with Odebrecht to build a section of the 621-mile Ruta del Sol highway connecting the center of Colombia with the Caribbean coast. The partnership was liquidated after Odebrecht admitted to paying a bribe to win the contract. In filings with the U.S. Securities and Exchange Commission and on calls with investors, Aval has repeatedly denied that it knew about its partner’s illegal actions. Pizano left secretly recorded audios of his conversations with Nestor Humberto Martinez, a lawyer who had represented Aval, in which Pizano raised concerns about irregular payments. In an interview with a Colombian TV channel, Martinez, now the nation’s Attorney General, said he passed on Pizano’s concerns to Sarmiento himself. Odebrecht bribed politicians and officials that helped it win contracts to build power plants, highways, airports, dams and other public works, mostly in Latin America. The company reached agreements with authorities in countries including the U.S., Brazil, Switzerland, the Dominican Republic and Panama. The Colombian case is ongoing, leading to a flow of damaging revelations. ← I’ve Interviewed 300 High Achievers About Their Morning Routines. Here’s What I’ve Learned.